As a Full-Time RVer there are just some things that have to be taken care of on a regular basis that most people don’t really give a second thought too. One of those things is taking care of human waste. Yes, there’s more to it than go and flush when you live in an RV. Even when you have a full-hook up there are still extra steps to be taken to ensure things are hygienic and properly done. Since being in our RV this has become a weekly “doo-dee” (LOL, pardon the pun) for me mostly, to make sure that the tank is properly cleaned & flushed and ready for another week. Unfortunately, it’s not something that can just be left open and drain on its own for several reasons that I won’t go into details on, yuck! 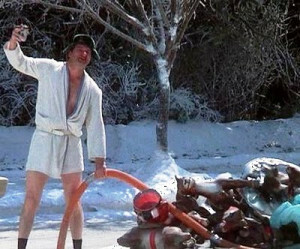 I do have to find some humor with it though and each week I get a picture in my head of Cousin Eddie from the movie Christmas Vacation standing out on the curb in his bathrobe exclaiming “Shitter was full!” And I have to chuckle to myself as I get through with this most unpleasant, but necessary task. Along with emptying the tank there is also maintenance that has to be done to it after each cleaning to ensure that any “unpleasant” smells will not waft into our small and enclosed home. First there is the “special” very expensive paper that has to be used, then there is the many different commercial treatments, powders, drop-ins, colored chemicals, and funky thick liquids to add that are supposed to make sure things are “pleasant” and will help things to flush out properly without getting clogged. The reason for my post today is not to gross you out, maybe get a chuckle on my behalf and be thankful you don’t have my weekly “job”. But I wanted to share a few things I have learned that have helped in this area without the use of expensive, toxic chemicals. Maybe you have a weekend trailer or live full-time in your RV also. I discovered this all-natural method that works better than the chemicals when I ran out of our normal treatment and didn’t have the money to go buy any more of these costly add ins. So I used what I had in my cupboard. I have perfected my recipe over the last few months and even in our Texas 100+ degree heat I have found this to work far better than anything I have bought yet. It has worked better than the commercial treatments to eliminate the odors, and I have had no problems with clogs or undissolved paper stopping up the exits. Unfortunately, we still have to buy the expensive paper, but I found the Scott Rapid Dissolve Bath Tissue has the best value for the money and works very well with this recipe. My All-Natural RV tank treatment. To freshen things up during the week, I keep a spray bottle under the bathroom sink with a 4:1 ratio of white vinegar to water, 1/2 cup baking soda , and a cap full of the Pine Needle Essential Oil . I use this mixture to clean the bowl with during the week. You just want to avoid any bleach products or any other commercial product with bleach. **WARNING*** Bleach mixing with the ammonia in urine can cause very toxic and deadly fumes. So NEVER mix bleach with ammonia products! I hope that this recipe will be of help to others, and if you have found a method or all natural remedy you use to keep your RV tank clean, fresh, and flowing good, share with us in the comments below. I would love to hear what others have been successful using so that we all may benefit by helping to share our knowledge and personal experiences with each other. This entry was posted in All Natural, Blog, RV Care & Maintenance and tagged All Natural, Chemical Free, RV Care & Maintenance, Tank Treatment. Bookmark the permalink.